WASHINGTON: The US has a detailed plan for infiltrating Pakistan and securing its mobile arsenal of nuclear warheads if it appears the country is about to fall under the control of the Taliban, al-Qaeda or other Islamic extremists, a leading TV network reported. “American intelligence sources say the operation would be conducted by the Joint Special Operations Command, the super-secret commando unit headquartered at Fort Bragg, NC,” a report by Rowan Scarborough of the FoxNews said on Friday. The report has also been posted on foxnews.com, the website of the TV channel. It said: “The JSOC is the military’s chief terrorists hunting squad and has units now operating in Afghanistan on Pakistan’s western border. But a secondary mission is to secure foreign nuclear arsenals — a role for which the JSOC operatives have trained in Nevada. The source said the JSOC had been updating its mission plan for the day President Obama gave the order to infiltrate Pakistan. “Small units could seize them, disable them and then centralise them in a secure location,” the source said. A secret Defence Intelligence Agency document, first disclosed in 2004, said Pakistan had a nuclear arsenal of 35 weapons. The document said it planned to more than double the arsenal by 2020. The FoxNews quoted a Pakistani official as saying the US and his country had an understanding that if either Osama bin Laden, or his deputy, Ayman Zawahiri, was located, the US troops and air strikes might be used inside the borders to capture or kill them. “What makes the Pakistan mission especially difficult is that the military has its missiles on the Soviet-style mobile launchers and rail lines. The US intelligence agencies, using satellite photos and communication intercepts, is constantly monitoring their whereabouts. Other warheads are kept in storage. 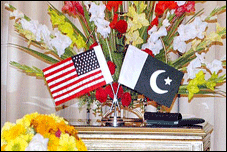 The US technical experts have visited Pakistan to advise the government on how to maintain and protect its arsenal. “Also, there are rogue elements inside Pakistan’s military and intelligence service, who could quickly side with the extremists and make the JSOC’s mission all the more difficult.“It’s relatively easy to track the rail-mounted ones with satellites,” said the intelligence source. “Truck-mounted are more difficult. However, they are all relatively close to the capital in areas that the government firmly controls, so we don’t have to look too far. “The JSOC is made up of three main elements: Army Delta Force, Navy SEALs and a high-tech special intelligence unit known as the Task Force Orange. The JSOC was instrumental in Iraq in finding and killing Abu Musab Zarqawi, the deadly and most prominent al-Qaeda leader in the Middle East. “There is speculation in the intelligence community that a secondary reason for Army Lt-Gen Stanley McChrystal being named the next commander in Afghanistan is that he headed the JSOC in 2006-08 and is read-in on its contingency missions in Pakistan.